You want a quick, easy, meatless meal that also happens to be gluten free? 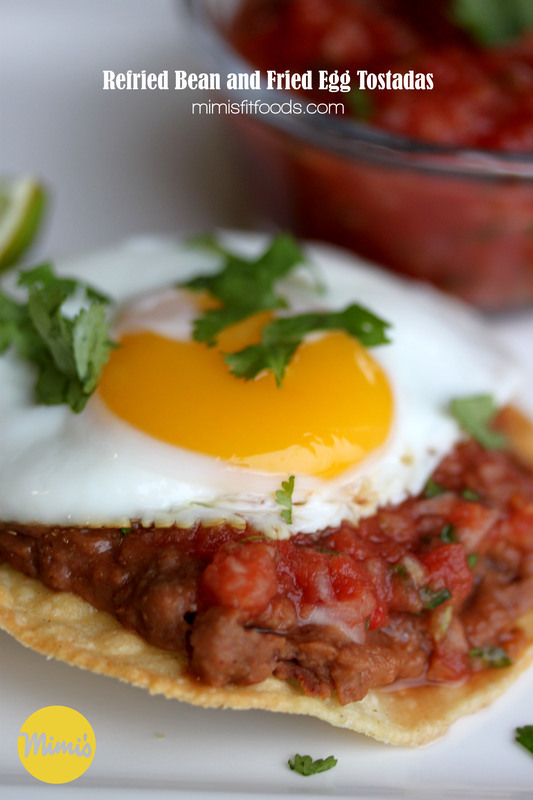 Enter in this Refried Bean and Fried Egg Tostada. It comes together in a flash. And, if you’re anything like me, occasionally (or more often than occasionally) you forget to thaw meat for dinner and shear panic hits with the frazzled, “What in the world am I going to make for dinner! ?” Well, never fear because this is a great solution! This recipe is a bonus because it also fits well for lazy nights, there are not a lot dishes, and you can seriously throw it together in 20 minutes or less. This recipe also uses that awesome Winter Salsa in the previous post. Of course, you can use your own variation of salsa, but I’m definitely going to recommend using the Winter Salsa so you can really cash in on the authentic taste. The best bonus . . . these tostadas taste awesome! They are satisfying and taste very authentic. My hubby made the comment that he thought this tasted like something we had eaten on vacation in South America (Nicaragua to be specific). So, take advantage of all these bonuses and throw it in your wheelhouse because if you don’t have a night when all the aforementioned bonuses are in need . . . . well, you’re super human and you better start teaching me your tricks! Preheat oven to 375 degrees. Spray corn tortillas (both sides) with nonstick cooking spray and place on a baking sheet. Bake tortillas for about 12-15 minutes, or until desired doneness/browning/crispness is reached. While tortillas are baking warm refried beans in a saucepan on stovetop over low-medium heat. Cook until heated through. Meanwhile, prepare to cook your egg. Heat a skillet over medium heat. Spray with nonstick cooking spray. Break your egg gently in to the pan and lower your heat to low. Cook the egg until the whites and yolk reach the desired consistency (usually this means that the whites are firm and the yolk is thick but not firm . . . offering that runny consistency). Repeat with second egg (unless your pan is big enough to cook both at the same time). Assemble your tostadas. Put 2 tablespoons refried beans on each tostada, followed by 1-2 tablespoons of Winter Salsa, an egg, and garnish with cilantro. Serves 1 (2 Tostadas Per Serving). This sounds right up my ally. I am excited your back to recipe’s again. Miss you!